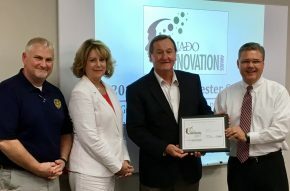 The National Association of Development Organizations (NADO) has announced that the Catawba Regional Council of Governments has been selected as a recipient of the “NADO Innovation Award” for two projects aimed at fostering economic development in Chester County: the Gateway Master Plan and the CDA Industrial Site Analysis Project. Catawba Regional, through a collaborative effort with Chester County, the Chester Development Association (CDA), and the U.S. Economic Development Association (EDA), developed the Gateway District Master Plan in an effort to proactively plan for growth in and around I-77 Exit 65 and Exit 62. This area of Chester County has seen substantial growth and development interest since the arrival of Giti tire’s 1.8 million square foot, $560 million facility that will employ in excess of 1,700. The project was funded by a partnership between Chester County and the Chester Development Association and matched with EDA funding secured by Catawba Regional. The plan was unanimously endorsed by the Chester County Planning Commission and has been approved through first reading by Chester County Council. Upon adoption, the Gateway Master Plan will become an integral part of the Chester County Comprehensive Plan. The CDA Industrial Site Analysis Project was funded by the Chester Development Association with the goal of identifying 30 to 50 potential new industrial sites within Chester County. Catawba Regional leveraged their GIS modeling and analysis expertise to identify potential sites that met a variety of infrastructure and geographic requirements for industrial development. Approximately 60 sites throughout Chester County were submitted to the CDA for consideration. The Catawba Regional Council of Governments will formally receive the awards at the NADO 2017 Annual Training Conference to be held September 9-12, 2017.